Lighting accounts for 15 per cent of a typical household’s electricity bill. You can cut your lighting bill and energy use by changing which bulbs you use and how you use them. Homes typically use a mixture of standard light fittings and downlighters or spotlight fittings. Energy efficient bulbs are available for both types of fittings. As with appliances the colour scale is used again to show the efficiency of light bulbs, covering all the different types, from spotlights to GLS bulbs to tubes. It also defines an estimated annual energy consumption based on 1000 hours use a year (just under 3 hours per day). 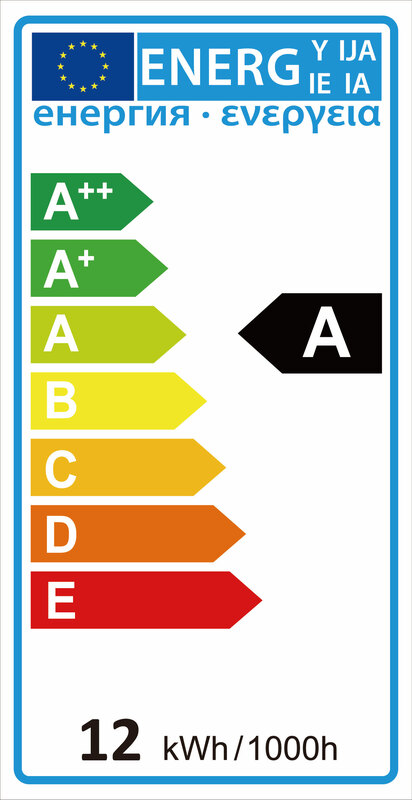 LEDs mostly achieve an A+ rating with the most efficient making it into the A++ band; CFLs will usually be B or A rated. Non-directional halogens can still be placed on the market until September 2018, but these usually only achieve the D class. - certainly not efficient by today's standards. Incandescent bulbs, which are no longer available, are generally rated either E, F or G.
Directional halogen spotlights are found in many homes, but these can no longer be placed on the market from September 2016, as the LED market has demonstrated impressive advancements in efficiency, with the cost continuing to come down. Luminaires and lamps that do not come with a bulb integrated have a label as well. This one does not provide any information about efficiency though - it's purely to identify which bulbs are compatible with the fittings. Home lighting has undergone significant changes since incandescent bulbs were the norm in most households. Upgrading your bulbs is one of the easiest things you can do to reduce your energy costs - across a household's worth of bulbs, savings can be surprisingly large. However, the last 20 years or so has seen a much wider range of products and technologies come on the market. There is a lot of information on bulb packaging, and a different fittings to take into account. Add the development of products such as smart light bulbs to the mix, and there's a lot to think about. This guide will tell you all you need to know to make sure you get it right when buying a new light bulb, so you can save money and great the ambience you want in your home. What different types of light bulbs are out there? 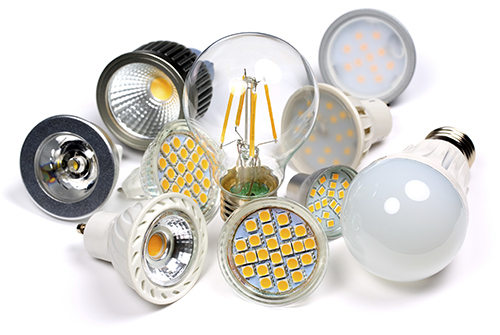 LED is the leading current lightbulb technology. A solid-state lighting technology, they greatly outpace incandescent and halogen bulbs in terms of efficiency and lifetime, are more versatile, reach full brightness immediately, and can be compatible with digital devices and interfaces for control. The cost of LEDs has come down more quickly than expected over the last few years, making the financial case for using them in the home and workplace a no-brainer. All common types of household bulbs are available in an LED variant, covering ceiling GLS bulbs, spot lights and candles, tubes, outdoor floodlights and panels. Topten only recommends LEDs in our product listings. As well as reduced purchase cost (with many spotlights now under a fiver and 100W replacement GLS bulbs available for under £10), running costs are a fraction of those from incandescents or halogens. A 5W LED spot light will cost under £1 a year to run; the annual running cost of a 100W incandescent will now exceed the purchase cost of an equivalent LED, many of which now cost under £2 a year to run. CFLs are a common lighting technology that works by passing a current through a tube containing argon and a small amount of mercury vapour, generating ultraviolet light; this then excites a phosphor coating inside the tube which produces visible light. Whilst CFLs are a big improvement over traditional bulbs in terms of efficiency and running costs, LEDs are still the superior option currently due to their reduced purchase cost. This is reflected in retailers ranges that now feature a much lower proportion of CFLs than was the case in recent years. 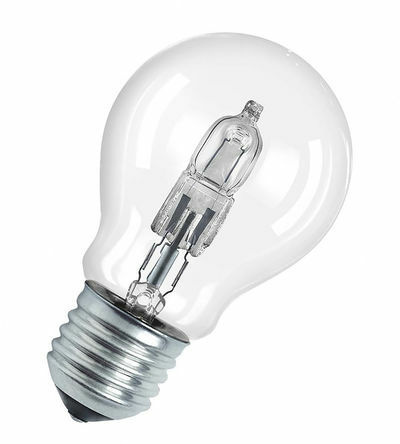 Halogen and incandescent bulbs are older technologies that work by burning a filament to create light. This results in them being much less efficient - a large proportion of the energy goes to creating heat and not light - for incandescents the amount of energy converted to light is typically less than 5%. Incandescent bulbs can't be sold anymore (these couldn't be placed on the market from 2012), but they still crop up in some places. A loophole enabling them still to be sold for a few years after 2012 when advertised as 'rough service' has since been closed. The ban of this product was certainly contentious to traditional lighting purists - but the economics don't add up anymore. A 100W incandescent, on for around 3 hours a day will cost you around £15 per year to run, more than the purchase cost of all the LED bulbs in Topten UK's 100W replacement section. With a running cost of about £2 a year, the LED bulb will pay for itself a little into its second year of operation. As a technology that only converts about 5% of the energy it receives to light (95% of it goes to heat), incandescent bulbs can no longer be sold in the EU. The phase-out is expected to save around 39 terawatt-hours of electricity each year in the EU by 2020. 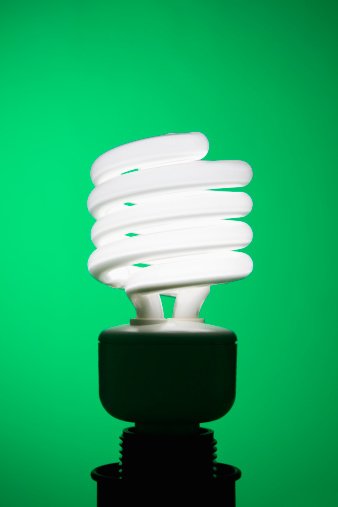 Incandescent bulbs were phased out in the EU in 2012. LEDs that can replace a 100W incandescent bulb will produce the same amount of light whilst consuming about 1/8 of the power. These energy savings really add up if you upgrade multiple bulbs in your house. A 100W incandescent bulb may cost upwards of £15 a year to run - LED equivalents can do the same job for less than £2. For mains-voltage, halogen spotlights, C and D class bulbs were phased out from September 2016. The market for LED equivalents has developed very rapidy over the last few years, meaning there are now many options to replace these at a good price. D-rated, traditional style halogen main ceiling bulbs will be able to be sold until 2018, when they will be phased out. However, until then there are many more efficient LED options available - see Topten's lighting section for options and savings estimates. Switch it off! 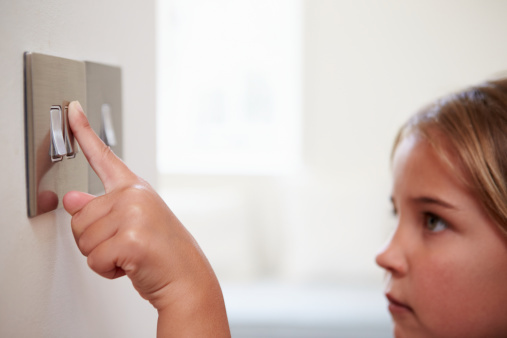 The most efficient bulb is one that isn't on - get in the habit of turning bulbs off when you leave a room. The savings do add up. Do you have the right brightness? A common problem with halogen spotlights is over-brightness - some households simply have more and brighter bulbs than are needed to illuminate an area. This can significantly increase costs if the bulbs in question are 50W halogens rather than efficient LEDs. Smart bulbs and controls. 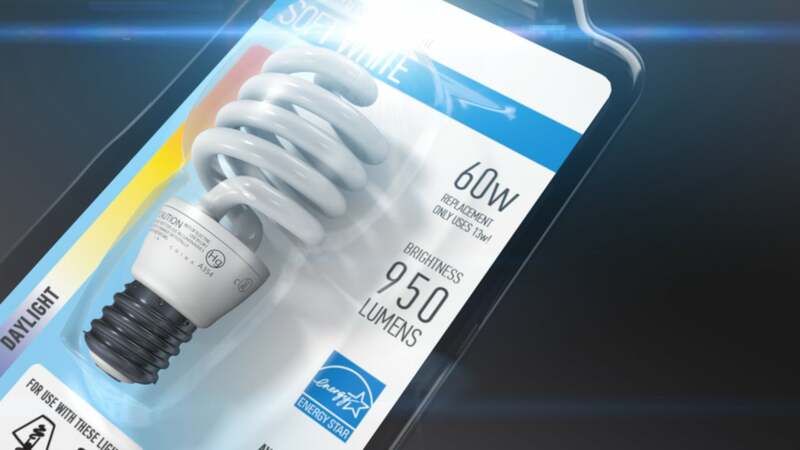 More and more 'smart' bulbs, that can be controlled remotely are coming on the market. Setting timers or having the option to turn these off if you've gone out and left the lights on by mistake is another useful cost saving strategy. We may be used to thinking about the brightness of a lightbulb in watts, but the lumen is a much more appropriate metric. Watts measure power, lumens measure the amount of light put out by the bulb. But it's good to think in lumens, rather than equivalent wattage - as light bulbs become more efficient, fewer and fewer watts will be required from an LED bulb to replace a particular rating of incandescent. The below table shows what lumen value you will need to replace the specified incandescent bulb. It's a guide only - lumen values are often fixed at common amounts for LEDs, but if you're not sure, it doesn't hurt to go a little brighter. As you can see the LED power consumption is a fraction of what your old traditional bulbs use. Check out the Topten lighting listings - they are grouped in terms of incandescent replacement and you can look for the lumen value by clicking on each bulb. Different bulbs emit a different colour of light. Light colour can vary from a yellow-ish colour to the bluish-white of pure daylight. The scale for this is measured in Kelvin, as this is a unit of temperature, it sometimes gets called 'colour temperature', but this just means the colour. Different trends exist in different countries, for example Scandanavia has often had a preference for a more cool white light than in Southern Europe. 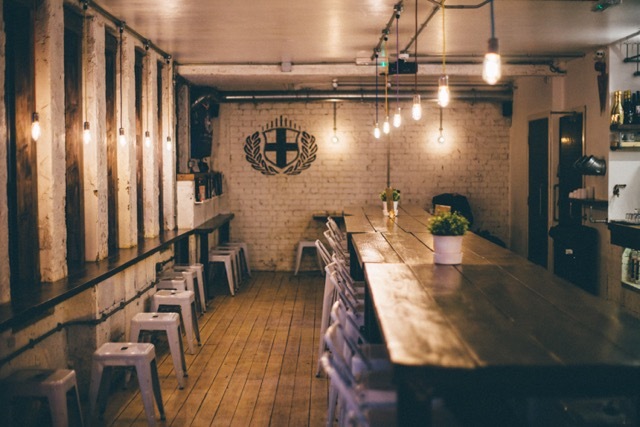 There has been a strong design trend recently in the home and in bars and cafes for the vintage glow of 'squirrel cage' filament bulbs, which emit a very warm white light of around 2200K. LED versions of these are available, with very low running costs compared to incandescent equivalents. Various studies exist demonstrating how different light colours affect everything from concentration and mood to circadian rhythm. 'Human-centric Lighting' is a hot topic in the industry at the moment, with much still to be found out. Topten listings feature the light colour of each bulb. 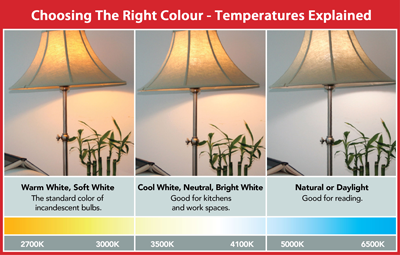 Often an LED bulb will be available in more than one colour temperature - our listings specify where this is the case. Some smart bulbs available are now capable of having their colour changed, depending on if you're trying to wake up or if you want a warmer ambience to read a book perhaps. If you're buying light bulbs and are not sure on the colour, ask your retailer for help. Some websites and apps now even enable you to take a picture of your room and see how it looks with different colour temperatures. How long does a lightbulb last? This is a big question. If you still have a stash of incandescent bulbs lying around the house, or you're still buying halogens at less than a pound, you might not mind so much if it blows after a year. If you're spending £8-10 on an LED bulb, it makes much more difference. A good LED bulb should last for over 15,000 hours. This is equivalent to about 15 years - on average, across the year, lightbulbs are on for about 2.7 hours per day. This figure may obviously be higher or lower in a particular household. A lightbulb's packaging will have a figure for rated lifetime - some claim up to 25,000 hours. It's difficult to fully quantify these claims - some third-party verification testing may go up to 6,000 hours, be accelerated and use some extrapolation but in reality it's not really feasible for manufacturers to have done actual testing for this period of time. Lightbulb packaging should also include a figure for 'switching cycles' - a measure of how many times the bulb can handle being switched on and off. Again, manufacturers' testing for this usually incorporates an accelerated program to test this aspect of the bulb's quality. But there's no doubt LED is a superior technology compared to incandescents or halogens when it comes to lifetime. LEDs, as a solid-state lighting technology does not produce light by burning a filament like traditional bulbs do. The main factor determining whether an LED will last as long as it claims is temperature management - it is important that the bulb utilises a good heat-sink element. 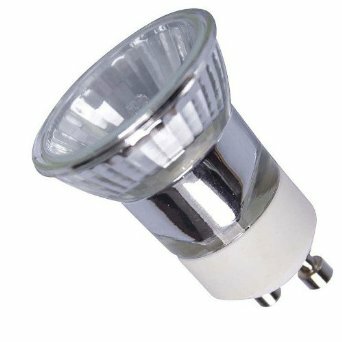 There are plenty of cheaper LEDs on the market that simply do not provide acceptable temperature management, so buying one of these may well turn out to be false economy. Look for a bulb from a reputable manufacturer with a warranty.